In Spring, bean scope is used to decide which type of bean instance should be return from Spring container back to the caller. singleton – Scopes a single bean definition to a single object instance per Spring IoC container. request – Return a single bean instance per HTTP request. session – Return a single bean instance per HTTP session. globalSession – Return a single bean instance per global HTTP session. In many cases,spring’s core scopes i.e.singleton and prototype are used.By default scope of beans is singleton. Here we will see singleton and prototype scopes in more details. This is simple pojo class having some attributes so here country has name. When We firstly called getBean and retrieved country object and set countryName to “india” and when second time we called getBean method it did nothing but returned same object with countryName as “india”. 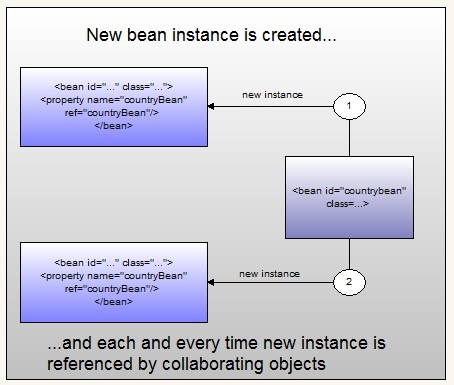 When We firstly called getBean and retrieved country object and set countryName to “india”and when second time we called getBean method it returned new object with countryName as “null”. That’s all about Spring bean scope. In next post,we will see initializing collections in spring.